Mittens are the way to go for warm hands. And these ones have added convenience features. Like a small zipper pocket on the back of the palm to keep your bus pass or your car key. And the Mittens are also PRO-TEXTTM touchscreen-sensitive in case you're outside and want to check email or snap a picture. The fleece lining will be sure to keep your hands cozy and comfort. Put the gloves on to fight cold weather, and order today! 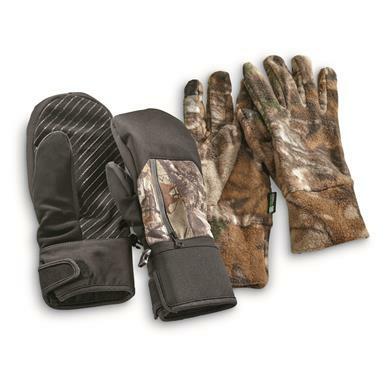 HOT SHOT Mens Touchscreen 3-in-1 Mittens, Realtree is rated 3.6 out of 5 by 7. Rated 5 out of 5 by lare64 from Good deal I bought these because mittens keep your hands warmer than regular gloves and with these inserts you can still have warm hands and take your shot! Rated 2 out of 5 by trapper from price was ok but it said they ran small is not right they run extra small got a set of l/xl i can't get them on so i gave them to my girl they fix fine i have reg hands not large. very disapointed in them for me. Rated 5 out of 5 by joe b from great price the gloves was very soft and comfortable. The gloves kept my hands warm. Rated 3 out of 5 by Duane from Good price but... The mittens have inner glove liners that can be used seperatly but used together as intended, the mittens are very tight and not as warm as regular insulated mettens. Classic wraps for chilly desert nights.